CAMBRIDGE, Massachusetts, September 10, 2014 (ENS) – Climate change could kill up to 90 percent of the forests covering the Rocky Mountains, warned the nonprofit Union of Concerned Scientists today in a new study based in part on projections made by the U.S. Forest Service. If climate change is allowed to continued unchecked, the scientists warn, these impacts will increase in the years ahead, reducing the ranges of iconic tree species, and fundamentally alter the Rocky Mountain forests that we know today. Stephen Saunders, report co-author and president of the Rocky Mountain Climate Organization, told reporters on a conference call today that the U.S. Forest Service has made projections of future climactic suitability for three tree species – Quaking aspens, Whitebark pines and Piñon pines. Study authors obtained these projections and, for the first time, translated them into land area. These are “astonishing projected declines based on medium-high emissions,” he said. For aspens, the Rockies’ only widespread deciduous tree species, the Forest Service projects an overall decline of 61 percent by the year 2060. There will be increases in some places, said Saunders, but in most places the decrease will be much greater – a 71 percent decline in Montana, and a 41 percent in Colorado. In view of these facts, the Union of Concerned Scientists is asking voters to demand action from their elected leaders to support and implement a comprehensive set of climate solutions, particularly by passing a Climate Resiliency Fund and supporting policies that reduce global warming emissions. Even if Congress does act in that way, despite the climate deniers that hold many seats, the greenhouse gases that are already in the atmosphere will persist for hundreds of years, trapping the Sun’s heat close to the planet. The changes we have seen so far have been driven by just 2 degrees Fahrenheit of global warming, he said. The Union of Concerned Scientists study found that from 2000 to 2012, bark beetles killed trees on 46 million acres, covering an area roughly equal to the state of Colorado. The U.S. Forest Service estimates that as many as 100,000 beetle-killed trees now fall to the ground every day in southern Wyoming and northern Colorado. Since the 1980s, the number of large wildfires in the Rocky Mountains has risen by 73 percent, or about 18 more large wildfires each year. Wildfires burned more than six times as much land each year on average from 1987 to 2003 compared to the period from 1970 to 1986. The mortality rate of trees has doubled in old-growth, undisturbed forests throughout the Rockies, with no compensating increase in the number of seedlings. 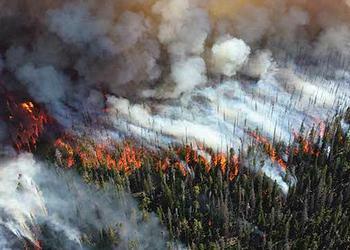 Scientists suggest that hotter and drier conditions are likely responsible. 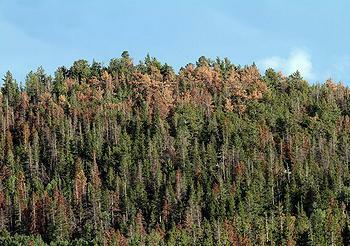 Whitebark pines are in steep decline because of disease, severe insect outbreaks, and changing fire conditions. The amount of suitable habitat for whitebark pines is projected to greatly diminish with continued climate change and the species could disappear entirely from some Rocky Mountain states by the end of the century. Quaking aspens have suffered severe and widespread mortality across much of the Rockies due to drought and high temperatures. Continued climate change could eliminate the species from much of its current range. Piñon pines have experienced a massive die-off triggered by drought and exceptional heat and will be lost throughout much of its existing range with continued climate change. Much of the current range of four other widespread species – lodgepole pine, ponderosa pine, Engelmann spruce, and Douglas fir – is projected to become climatically unsuitable for them by 2060 if heat-trapping emissions continue to rise. “We need to hold our leaders accountable,” said Dr. Funk.